After Just Fab introduced her fabulous Ghetto Studio, which was a ghetto setup for the butterfly lighting (AKA Glamour Lighting; AKA Paramount Lighting) I felt like taking a shot with this kind of setup. (Pan intended). It was my bad luck that the PVC store next door has ran out off all the PVC piping they usually hold (Yea, right! try – my wife will kill me if I build another PVC monster in the living room). I had no alternative but to go with another butterfly lighting solution. (The final deal, by the way, was “OK, OK, I will not build it, will you model for me? pleeeeease?”). Butterfly lighting or Beauty lighting is usually done with two lightbanks (softboxes) one directly on top of another angled toward the subject (placed directly in front of the set up). Sometimes the lower light is replaced by the reflector. What she [just fab] has done here (which is genius, I must say) is replaced the top softbox with the translucent material, and the bottom with a reflector. The strobe is fired directly through the rip-stop (DOWN) into the reflector creating two light sources. You place your lens between the two panels from behind. The panels should look like jaws about to eat the subject. Butterfly lighting got its name from the (SUBTLE) butterfly like shadow created below the subject’s nose. For the set up (click for larger image) I used two SBs (an SB800 and an SB26) mounted with shoot through umbrellas. I used one “regular” pneumatic light stand and a collapsible Manfrotto 001B stand. The nice thing about the 001B is that it can be opened flat and get right “inside” the space that the legs of the regular stand create, making it virtually a single stand. (If I had a third hand, I’d use it). 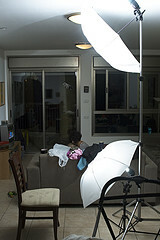 The usual butterfly setup uses two softboxes or a softbox and a reflector. Thinking about the reflector, helped me set the initial power ratio between the flashes. I set the upper on for 1/8 (and in some shots for 1/8 to “burn” the skin). I set the lower flash to 1/32 to mimic a dimmer light coming from a reflector. The rest was easy – I placed the camera very close to the light stand, placed my wife right between the jaws and took a few shots. At some point my daughter decided to join the party. Check out the shots on the DIYPhotography Flickr pool.